The government moved to distance itself from reports of the sightings of rats near the door to Number 10 Downing Street, and also denied that there was a desperate need for any form of pest control. Civil servants said that whilst the vermin infestation had seen a noticeable increase since May there was no need to replace Number 10's famous Chief Mouser to the Cabinet Office, Humphrey, who died in mysterious circumstances in 2006. Humphrey the car was adopted by Downing Street in 1989 but was forced to leave office under a cloud after Labour won power. He famously came to prominence giving damning testimony on the use of biological agents, such as Camembert, to a House of Commons select committee investigation into WMD - Weapons of Mouse Destruction. 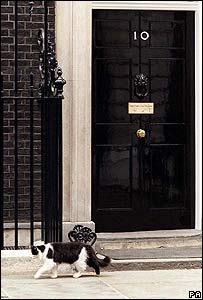 However whilst the prime minister's office is adamant that in this period of government austerity there should be no increase in the public sector tuna bill, there are other factions keen to pursue the use of chemical means to control Downing Street's pest problems.